Construction on the new building of the Royal Alberta Museum in Edmonton is complete. 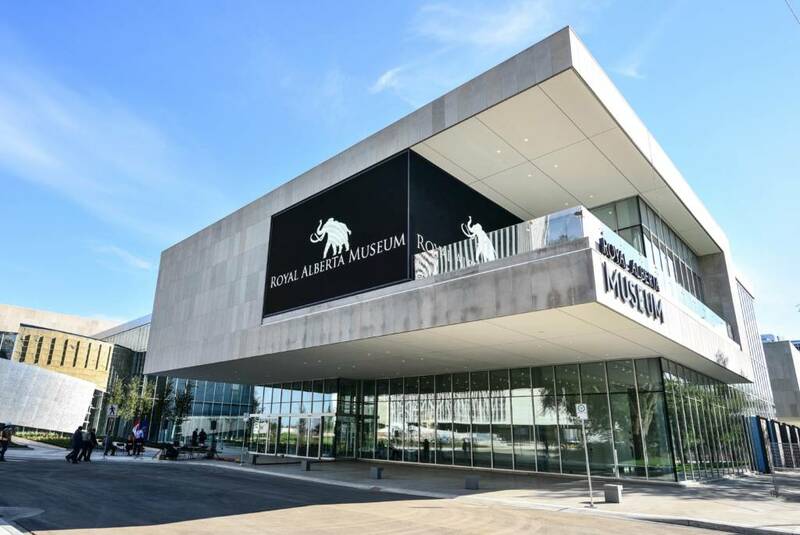 Construction on the Royal Alberta Museum’s (RAM’s) new building in Edmonton is complete. It will open its doors later this year to a public waiting to observe the secrets it has held since its closure on December 6, 2015. Since its initial opening on December 6, 1967, the museum has always presented its visitors with history and cultural enrichment. The museum has since developed its collections and capacity to the point of needing a new location. On the outside, the new structure displays mosaic murals by artist Ernestine Tahedl, which were reclaimed from the old Canada Post building, restored, and installed by Scorpio Masonry. One of the enticing experiences outdoors at RAM is walking on the cast-in-place finish comprising mirrored glass created by mixing recycled glass (cullet) in concrete. New-to-Edmonton Indiana limestone—pulled from the same quarry as stones used in the Empire State Building in the United States—has been employed on the interior and exterior of the building along with glass and metal cladding to create a modern but leaning-to-historic impression. Indiana limestone was selected for its durability and softness as it can withstand machine cuts without high failure rates or problems; it also carries consistent colour in large batches. Two main entrances offer visitors expedient access to the lobby—the west side aligns with 99th Street while the second is located on the east side and facilitates group arrivals as it connects by stairs and elevators to public transit. Huge solar windows brighten the museum’s lobby. Proceeding from the entrances, the senses are engulfed with a bright and cheery encirclement. Huge solar windows cast light throughout the area. A sky-high glass curtain wall complemented with ceramic frit upper windows provides the subtle shading this highly illuminated space requires. Sturdy granite tile floors are employed to accommodate the stresses of visitors and create resilience in a high traffic area. There are numerous references to the province’s history around this encirclement. A sweeping view of the lobby culminates in a curvy stairway, which was created with the intent to “draw inspiration from the canyons and potholes in the Rocky Mountains,” as described by Donna Clare, the project’s lead design architect from DIALOG Design. It connects to the second floor. The Feature Gallery located on the main floor will house temporary exhibits. Around the Feature Gallery is a dot-matrix patterned, metal wrap that presents in dramatic fashion Alberta’s watersheds, specifically, the North Saskatchewan Watershed as an area of land that catches snow and rain to then drain into a larger body of water. Structurally, the Feature Gallery is column-free. 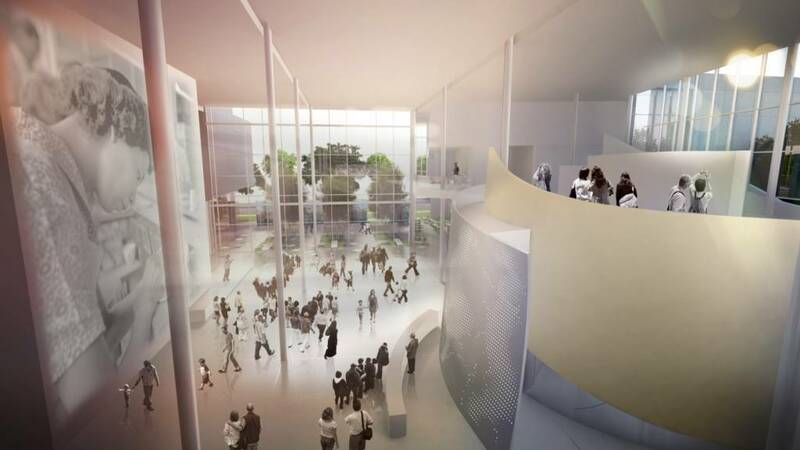 Movable walls and two entrances provide maximum flexibility to change portions of the exhibits and allow the space to be changed or altered for various exhibitions. The project team also commissioned specialty casts for the foyer area. The famed Manitou Stone (an ancient meteorite sacred to the Indigenous community) is located in a dedicated, admission-free gallery space above the admissions desk. A first for the Royal Alberta Museum are the large glass-encased conservation labs providing guests with the opportunity to observe first-hand the methods and processes of artifact restoration. Two main spaces in the new RAM are the Natural and Human History Halls displaying 5300 pieces. The Natural History Hall has four separate galleries including an expanded prehistoric venue now termed “Ice Age” (a noted connection to the city’s “Ice District”). A separate gallery revealing “Ancient Alberta” is also shown. Moving the 2.4 million artifacts from one premise to another was a huge challenge for the project team. These exhibits tell the stories of thousands of years of human occupation within their appropriate contexts, including their connection to the Europeans, and covers 200 years of trade. Each main area is divided into multiple spaces furnishing the most intriguing and compelling stories Alberta has to offer. They attempt to reveal what the province was and is today. The RAM believes the most honest method of audience engagement is through the accounts of everyday Albertans. The museum’s interior gallery block features an autumnal colour palette that along with the staging of displays carries a theatrical quality. This is elevated by the graphics fashioned by multiple artists and more than 120 mannequins specially created by Onetwosix Design. The Children’s Gallery shows a sunlight deflection feature that allows scattered light to suggest an aspen tree canopy while custom pierced wavy metal forms behind the admissions desk represent a prairie lightning storm with ice crackling atop a frozen river. The museum’s gift shop was created by Nyhoff Architecture as a family-friendly space where merchandise can be displayed in a seamless style with a splash of red-on-predominant white. A blend of other visual and historic nuances await people when journeying through as the design purposefully encourages not only admission visitors, but the casual guest who wishes to view and experience this museum by simply strolling through the foyer. 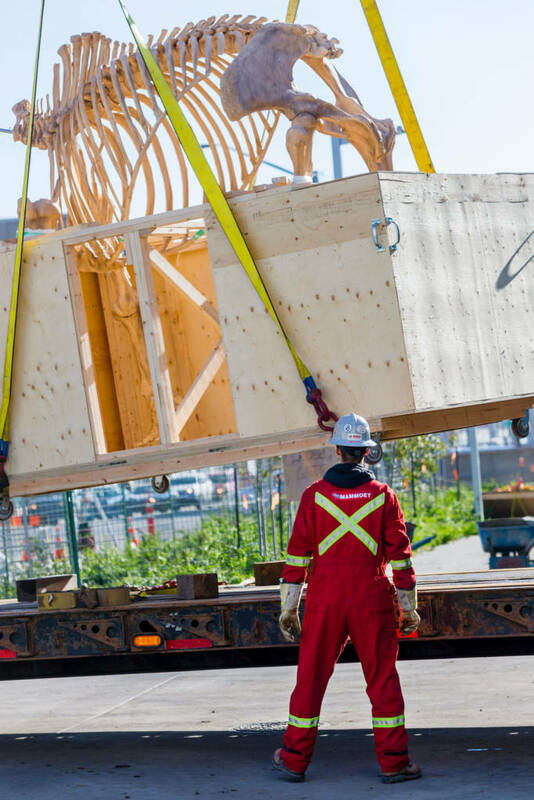 The museum’s construction team recycled 90 per cent of the materials from the razed building. Canada Post’s well-known heritage clock face has also been installed outside the museum, close to its original place. The new structure is temperature controlled and air filtered to best preserve artifacts and to maintain the building equilibrium. The storage areas are designed to permit compacted accommodation for artifacts not currently on display. Storm water is captured for irrigation purposes alongside expanded bike racks and enhanced walkable spaces. The building is designed to meet the Leadership in Energy and Environmental Design (LEED) Silver standard. One of the challenges the project team faced was moving the artifacts from one premise to another. Barcodes were assigned to each of the 2.4 million artifacts in RAM’s care for tracking purposes. Space planners helped navigate a multitude of boxes and crates filled with pieces from their old location to final installation in the new building. 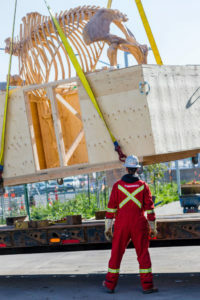 For instance, Mammoet Canada Western handled the move of the fragile ice age skeletal mounts. Also of significance are the breadth and variety of Indigenous stories incorporated in the new museum. The project team extensively consulted with a 24-person Indigenous Content Advisory Panel, including Elders, ceremonialists, artists, and other cultural knowledge holders from Treaties 6, 7, and 8. 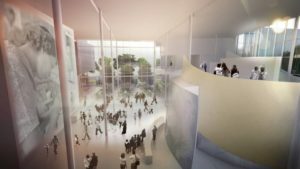 The project team believes the new building helps RAM achieve the five universal functions of a museum—acquisition, conservation, research, exhibition, and communication. Shantel Susan, founder of Shantel’s Art & Design, is an art consultant providing services to individual and commercial art buyers as well as artists. 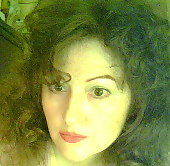 Susan contributes articles to art, design, and art business publications and blogs. A member of Visual Arts Alberta (CARFAC) and the Canadian Society of Decorative Arts (CSDA), she holds a bachelor’s in business and arts and diplomas in finance and interior design. She can be reached at shantel@shantelsartanddesign.ca.